Recent housing project in the Australian bush, a housing project in Bundeena, New South Wales. This residential project is for 15 houses set in natural bushland at Bundeena in the Royal National Park south of Sydney, Australia. 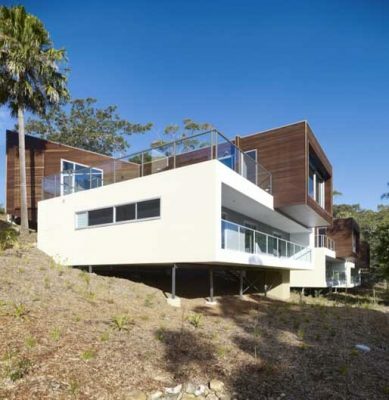 The houses are on a sloping bushland site and all have great beach views. The houses are light construction and are a cross form with an east-west timber clad cantilevered living element above for sun and a north south solid bedroom level below for views. This cross shade creates a large north facing terrace and cantilevered pool for each beach house.